Anyone on holiday in the Dolomites in South Tyrol cannot escape the charm of Hochpustertal! With its fascinating landscape, the places of historical interest and the charm of Bruneck and Cortina, Hochpustertal in South Tyrol will enchant you afresh every time. Come and enjoy a dream holiday in Innichen in Hochpustertal! In spring, summer and autumn, you can go hiking, cycling or mountain biking, or soak up the lively atmosphere of the towns. In the winter, there is still something for everyone: downhill skiing, sledding, cross country skiing, spa activities, and much more besides to make your holiday in South Tyrol truly memorable. Even just the fantastic mountain view at Hotel Leitlhof is sufficient reason for a holiday in Innichen. Then there are the many trails for hiking, mountaineering and climbing in the UNESCO World Natural Heritage Site of the Sexten Dolomites! As a member of the chain of hotels for hikers, the Leitlhof offers certified expertise in this field. Cartographic material and friendly advice can be obtained directly at Hotel 4*S Leitlhof. Hermann, our hiking guide, accompanies guests in the mountains four times a week and is always happy to answer questions about climbing in South Tyrol. Pustertal offers an infinite number of trails of varying difficulty. The excellent network of cycle paths along the River Drava is the perfect terrain for cycling tours with your family or partner. Along the way you will discover the romantic towns of Hochpustertal. More athletic road bikers can follow stretches of the Tour Transalp and Giro d'Italia and discover the nearby valleys. A number of mountain bike trails lead more determined cyclists up to stunning mountain pastures. Here we are already at alpine altitudes. Please note that the Sexten Dolomites are a UNESCO Heritage Site and to be protected accordingly. Make sure to respect nature, keep to the signposted trails and bring your waste back to the hotel, where we can dispose of it for you. Enjoy the environment and the beneficial atmosphere of the pedestrian area of ​​Innichen near the Leitlhof, or set off from here to discover the other towns in the vicinity. Bruneck and Cortina are just 30 km away. Even Lienz in East Tyrol in Austria is not too far away for a pleasant shopping tour. Come and spend a relaxing day full of inspiration in a area steeped in ​​history, and be enchanted by the historical and artistic monuments of Innichen. The tragic events in the Sexten Dolomites during World War I and the history and geology of the region are evident at many sites and museums worth a visit. 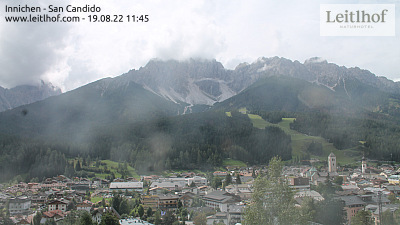 Like, for example, the Visitor Centre of the Three Peaks Nature Park of Toblach, the DoloMythos Museum of Innichen, the largest museum dedicated to the Dolomites, the Wassermann House Museum in Villabassa, or the Bellum Aquilarum open-air museum. At Hotel Leitlhof you will experience 4-star Superior wellness and relaxation! Escape the stress and come to be pampered in our Wellness Oasis. You can bask in glorious sunshine on deck chairs, or enjoy some healthy exercise in the open-air rooftop pool or fitness area of the Leitlhof. Send us a request without obligation - and we will be happy to advise you on your perfect holiday in Hochpustertal!